Each size is available with either one or two 18" leaves, allowing you to accommodate guests with ease. Classically designed and full of warmth, the French Country extension dining table exudes humble elegance and welcoming style. 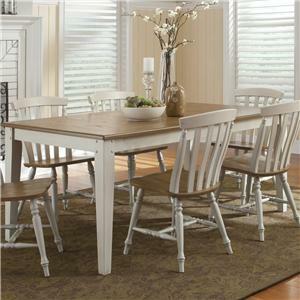 This table is available in extension and solid table top styles. 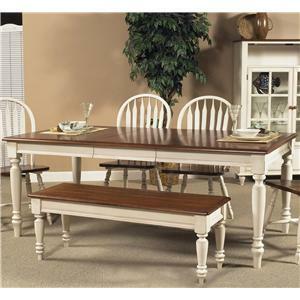 The Lyndon Custom Dining Customizable French Country Extension Table with Splayed Legs by Lyndon Furniture at Dinette Depot in the Brookfield, Danbury, Newington, Hartford, Connecticut area. Product availability may vary. Contact us for the most current availability on this product. Case Construction Hardwood construction with customizable wood options. Finish Lyndon Furniture abides by Vermont's strict environment laws to create finishes that contain far lower Volatile Organic Compounds and Hazardous Air Pollutants than current American industry practices, and far exceed imported products. Finish & Paint Options Multiple finishes available. Case Detail Items feature simple tapered legs and flared legs. 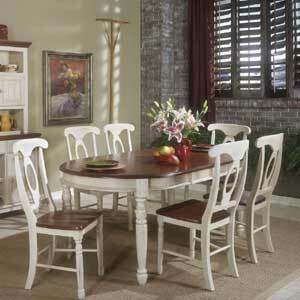 Description: Top Tables are available with solid tops or extension tops made for accommodating leaves. Customizable Options Select items feature customizable wood and finish options, with tables available in your choice of Maple, Oak, Cherry,or Walnut woods. Multiple sizes are available with your choice of a solid top table or an extension table that includes either one or two 18" leaves. Customize dining chairs with your choice of seat upholstery, available in three different fabrics. Additional customizable options may be available upon request. 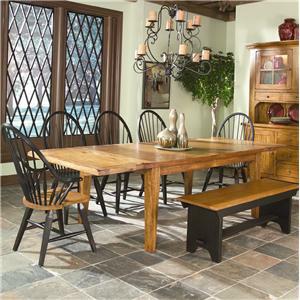 The Lyndon Custom Dining collection is a great option if you are looking for Casual furniture in the Brookfield, Danbury, Newington, Hartford, Connecticut area.